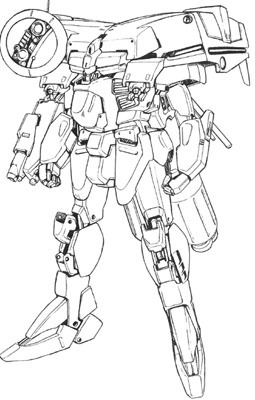 The MSA-007E EWAC Nero is an Early Warning And Control (EWAC) mobile suit based on the MSA-007 Nero. Although Minovsky particle interference prevents the use of radar and radio communication, the dispersal of these particles was prohibited by the Granada Treaty that ended the One Year War, and so radar search and detection is still effective in areas with low Minovsky particle density. The EWAC Nero is designed to detect enemy machines and gather intelligence, then relay this information to the Combat Information Center (CIC) aboard its mothership. The huge head of the EWAC Nero contains long-range radar antennas and is equipped with multi-sensors for passive intelligence gathering, while its backpack contains data processing and communications systems. The information it gathers can be relayed in real time via radio and laser signals, or recorded onto the data pods stored in its backpack for later recovery. The EWAC Nero can also be equipped with Remotely Piloted Vehicles (RPVs), wired cameras, and various other reconnaissance equipment. Its two-seater cockpit block houses a pilot and an operator to control all this equipment, and extra propellant tanks are attached to extend its operating time for long missions.